This week, between card-making, grocery shopping, dinner planning, and (oh yeah) trying to raise an empathetic, sympathetic, caring, nurturing, and hilarious human being, I've been desperately trying to come up with a system for organizing my life. Conclusion: I reeeeally need a planner. There are some amazing planners out there. 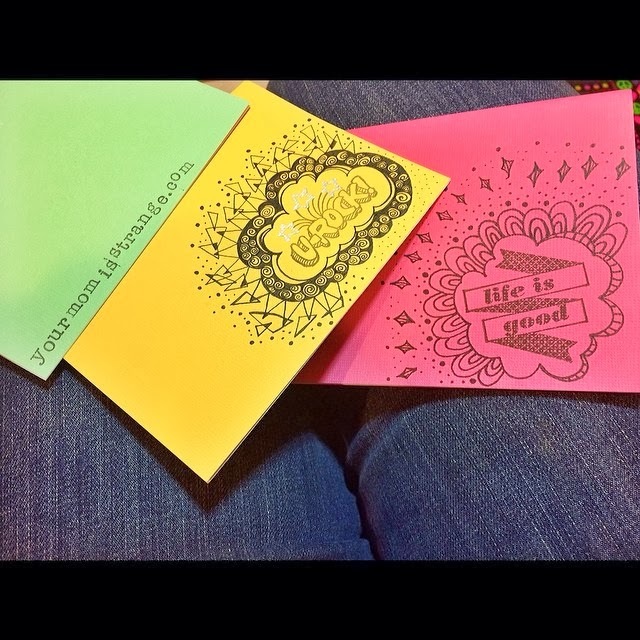 Some of the BVTMoms suggested Erin Condren life planners (here). 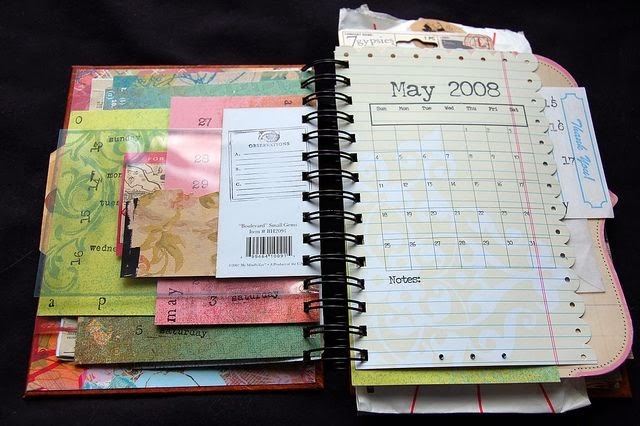 For $50, you can customize your planner and get all the pages and organizing stickers/supplies that you need. I love that idea, but can't afford it just yet. I'm also hesitant to spend money on planners in general, because, let's face it, I don't stick with one thing for long! Other moms swore by Filofax (here), which looks to be about the same price. The outer cases look rugged and beautiful! Waaaannnt! THEN. In my searches, I discovered the world (and I do mean WORLD) of DIY planners. Oh boy, is my crafty-brain twitching right now. I thought that maybe I would put together my own little planner in a cute, little notebook. I even thought about making a mini binder and creating some cute (and possibly doodled/zentangled) planner pages that I could share on my blog. "Wow, I'm so original," I thought! My crafting fantasy continued until I was basically swimming in a sea of beautifully designed pages, and every mom in the world was downloading my products on their journey to become more organized. Yep. Me. Mrs. Organized. The mom who found her phone in the bread box two days ago (true story). Regardless, as you would probably expect, hundreds (if not thousands) of creative 20-somethings and moms have already done what I have dreamed about. Yawn. 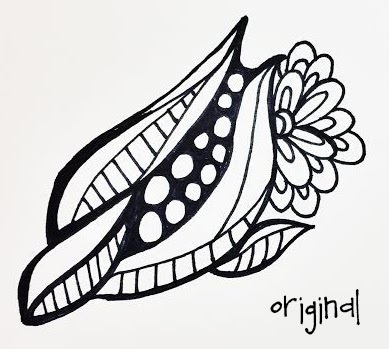 Oh well, I can still make my own and share my own doodle/zentangle pages with you, and I will if I ever get organized enough to get around to making them, digitizing them, and uploading them to Etsy. I’ve been wanting to take E to the Jay Peak Pump House for awhile, but I was unsure about cost, driving distance, etc. 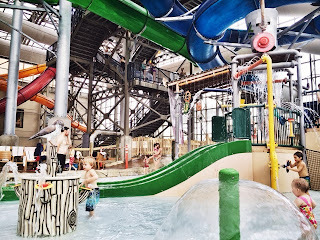 The other day, Nissa at BVTMomsBlog had a great post (here) listing some ideas for local indoor fun. The Pump House was on the list, and I just had to try it out! I checked the rates on the website and found out that E would be free (ages 3 and under), and I would only have to pay the $10 “supervision” rate. Seriously. 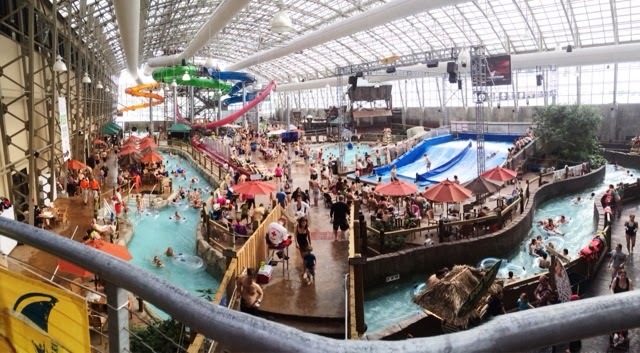 Ten dollars to go to a water park for a day. You can’t beat it! 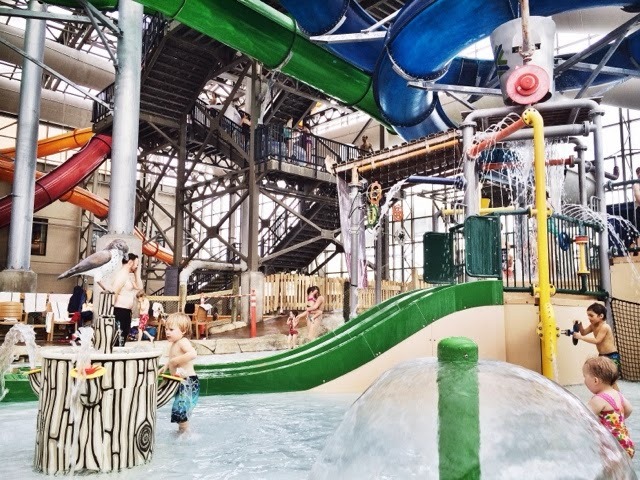 The play area for the younger kids is wonderful – mini waterslides, water guns, fountains, a huge bucket of water that dumps over the play structure, a la Typhoon Lagoon at Disney. 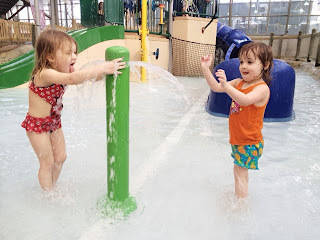 There are so many ways that the kids can interact with the water. E was a little nervous at first. She spent the first hour staying by my side and taking it all in. We finally went up on the play structure together, but one drenching soak from the big bucket had us moving back to the wading pool. She was a little startled, but we laughed it off. When she’s a little older, I think she’ll love it. But, for now, the yellow “baby” waterslide is perfect. She watched and waited for a lull in the crowd of kids lining up to get on the yellow slide. I asked her if she wanted me to take her to it. She said, “No, Mama. I do this by myself.” She had clearly spent the last half hour scoping out the scene and thinking about how she was going to tackle that amazing yellow slide. After she got the hang of it, she jumped right in line with other kids who were now flocking back to the main attraction. She took her time, even as some kids pushed her aside and flew past down the slide. She was unfazed (thank you, day care!). She patiently waited her turn. One little girl who was older led her to the slide and helped her up the stairs, letting E go first. The girl looked up at her father who gave her a happy nod of approval. Every other child who flew past E was being chased by a mother yelling, “Wait your turn!” I silently thanked God for a positive experience with parents who were involved and paying attention. Kids will be kids. We didn’t mind waiting, but it was nice to see parents trying to simply make their kids more aware of the younger ones. 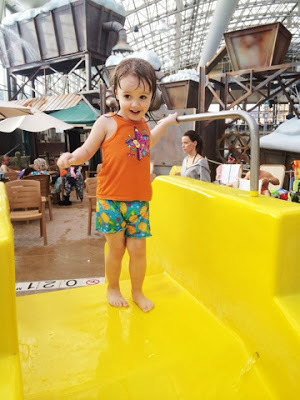 E sat down at the top of the slide, and though there was a line a mile long behind her, she sat for a minute to throw her arms in the air, look to the skies, and say, “Ready! Set! GO! !” Everyone else around her faded into the distance, into a garbled sea of splashes, laughter, and chatter. And in her own, little, secret space, she quietly stole her own little moment of sunshine. This is me. Waiting, watching, sneaking, then carefully being happy when I feel it’s safe to do so. And this is Mark. Not afraid to try something new, but waiting and studying every move, planning how he will do it until just the right moment, and doing it skillfully, perfectly, without fear. This was really the first time I saw her interacting with a large group of kids in a public setting, and to see mine and Mark’s personalities pop up in a very social way was amazing. She has learned most of her social interaction through day care, so I think I expected that she would just act like the other kids. This “nature vs. nurture” thing blows my mind. Before I knew it, she was comfortable running to each activity, getting drenched. A diaper change didn’t deter her. The entire time I was changing her, she kept asking, “We go back waterpark? We play in water more?” Sure, why not!? We stayed until dinner time and ate a light dinner at the pizza shop off the lobby. I don’t know what it was about this day – the fact that we got to play in the water, that it was 84 degrees inside, or that the entire place felt like a Disney park from my childhood. It was by far one of the best days of my life. I was relaxed, playing in the water, with my little girl, in the middle of February, after a long winter of too-cold days and snow storms. It didn’t matter that changing clothes in the bathroom stall with a 2-year-old was traumatic for both of us. She put her hands on the toilet seat and smiled at me, knowing I would scream, “NooOOOooo!! Err-mah-gahd!! Germs!” She found the “override” button for the auto-flush toilet which triggered a very “splashy” toilet to spew water 10 feet in the air, in a 2-foot by 3-foot stall, causing me to press my barely-clothed body against the side of the stall and scream, “NooOOOooo!! !” again. It didn’t matter that I had to put both of our bare, clean feet on the floor of a public bathroom, even though it caused me to squirm and cringe like I was walking through snakes. Or that, at some point, the baby wipes must have fallen out of our bag, and I ended up having to use a spare diaper to wipe down a poop-covered toddler who was using one of my favorite dresses as a changing pad (gah, I always forget that thing!). It didn’t matter that… that diaper ended up not being a “spare” diaper, and I had to take an un-diapered, un-potty trained toddler to a restaurant where she drank an entire bottle of apple juice then put her in her car seat for an hour-long ride home. It didn’t even matter that… she said she “spilled” her juice in the car, that she wanted to stop at “(Old) McDonalds (House)” to use the bathroom, and that she could definitely wait 3 miles until we got there. But what she actually meant was that she had peed through 5 layers of clothing and her car seat cover. And I didn’t even mind that we ended up having to stop at Dunkin’ Donuts instead to change my toddler (and let her stand barefoot in another public restroom, because we lost her socks), while I dried her pants under the high-powered hand dryer. She thought this was hilarious, and laughed so loud each time I turned on the dryer that I thought she was going to hurt herself. We had our rough moments, but it was worth every minute to have a little summer break after a long winter! We got home, and she gave me a big hug and said, “Thank you, Mommy. I had fun playing in the water with you!” I gave her a bath to wash off the chlorine and bathroom germs, and Mark put her to bed. She cried to go back to the water park but once in her crib, she fell right to sleep. Sweet dreams, bubby! We’ll have more fun tomorrow! "Oh, Christmas tree! You are so pretty!! Christmas tree! You are so beautiful... ... to me! Oh, Christmas tree! Would you like a donut? This morning E had a meltdown, because she wanted to help me make her lunch for day care. Ok. I had just gotten out of bed and was trying to pry open one of my eyes that had been gooped up with some day-old mascara. I blinked a few times, pushed a mess of curls out of my face, then calmly worked out a solution with her. She wanted to stand on her chair at the counter, but the counter was a mess, so I talked her into sitting on the dining room table and brought the sandwich fixings to her. I stood by her side and went about my task, making a turkey sandwich for her lunch. Mark followed me to the table, as I had swiped all the sandwich ingredients, and he was about to make one for his lunch. We worked away. E hadn’t had breakfast yet, so she sipped on her milk and stole a slice of Mark’s bread and chewed a large hole in the middle of it. I replaced the bread on his plate. I filled a bowl with peas. Before I could get the lid on it, she stole a few, and I refilled the bowl as I went about putting her lunch together, grabbing a yogurt out of the fridge, throwing a banana in her bag. The mommy guilt took me off guard this morning. I suddenly asked myself, “Is this okay?” I’ve tried so hard to bring some order to my life, to not drag E through the chaos that is the life of a creative, distracted, off-the-wall, fly-by-the-seat-of-your-pants mama. Sometimes I feel like such a child myself when I look at my messy apartment, when I see E running around covered in marker ink, with lentil soup in her hair. And here she was, this morning, sitting in the middle of the table, not yet dressed or diaper changed, eating a “breakfast” of wheat bread, peas, and milk. This is my fault. I haven’t created any consistency in the mornings. She doesn’t know what to expect. I let her do almost anything she wants (within reason), to be like me, to help. And when she does typical toddler stuff (like eat the bread off Mark’s plate), I just fix the hiccup and move on. But I sometimes think those are other people's words. My heart screams out to her, “Here is your world with minimal boundaries. Adapt to constant change. Survive. Take what you want (without hurting others). If you can climb a table, you can climb a mountain. Be whoever you want to be.” And when I do say, “no,” she does listen, and I explain why. Because we’ve always talked to each other. We can compromise, and in that, there’s respect. I know that I have a toddler who says, “I’m sorry,” and “Be careful, Mama,” who shows compassion, empathy, self-awareness, who treats others with respect, who respects my voice (even when she doesn’t agree with it). I’ve had to say, “Please don’t take food off my plate right now, I’m eating that,” and she listens. And I know that, I can organize pieces of my life, create small, consistent steps and schedules for her, but somewhere in between those dots, between dinner at 5pm and bedtime at 7pm, there will be chaos. Beautiful, fun, do-whatever-you-want (unless it involves getting injured) chaos. And that just has to be okay. Because this is me. 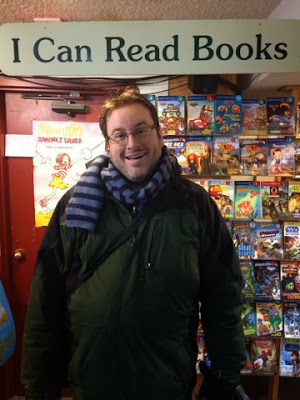 And this is me accepting myself (almost entirely – big step here). Finally. By seeing her turn out okay growing up in my world. I'm sooo excited to offer a real, handmade product in my Etsy shop this week (HERE)! AND!! ALL profits will go to help a local Vermont family in need. I'm hoping to make 20 cards total, so watch your Facebook news feed throughout the week for new designs! If you're not already following me on Facebook (huh? why? ), please click here to visit (then Like!) 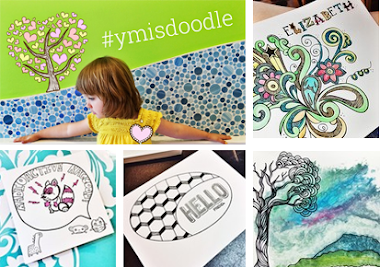 my FB page, so you won't miss the next batch of designs! Each card is $4.00 and handmade by yours truly! If you see a design you like (or would like a custom phrase or name on your card), please specify when you place your order. Otherwise, I'll send a random design, chosen especially for you! Shipping is free, so for the cost of a store-bought card, you can get a special handmade/custom card and help a family in our community! Woohoo! I reeeeally love drawing E's stuffed animals and making them into little cartoons. She has this little duck toy, and I draw it for her a lot in different scenes. She loves it! Here is a new take on ducky... Introducing, that quirky fun friend that every average duck needs: Quirkity Quack. Spoiler alert: It's me as a duck. 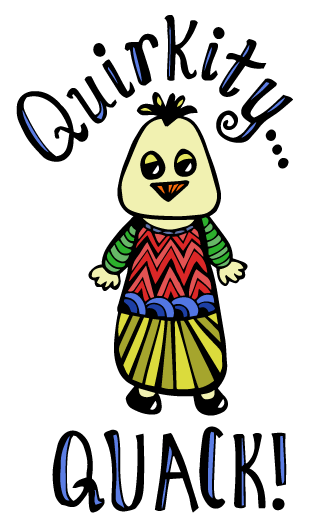 I used the digitizing technique from my previous post to bring some smooth lines and wild colors to Quirkity Quack's outrageous outfit. Okay, so after spending a good majority of my evenings this week working with Illustrator and my Wacom, I've come to the conclusion that I... hate it. No, hate is a strong word. I just feel a huge block trying to work on the computer. It's strange, because when I design, I need to work on the computer, but doodling/drawing/sketching, I just need to do it on paper, at least for now. So, I've finally worked out a technique I'm comfortable with -- doodling on paper, then importing into Adobe Illustrator. Surprisingly, as long as the lines I drew were nice and solid, I was able to do a Live Trace in the program and add color. And, guess how I imported it?? With my iPhone! (Hallelujah! Halllllelujah!) Quick and Easy! I took a photo in good lighting with my phone then adjusted the levels with the Afterlight app -- The settings I used in Afterlight: Clarity first to bring out the black lines, then Brightness to lighten up the paper, then Contrast to bring out both the highlights and shadows. That order worked best. Open the Image Trace Window to adjust settings. I'm assuming I'll need to use different values for different images, depending on the level of detail drawn, but I think this is a good starting point. Once the trace is done, Object > Expand will reveal the paths around your image. You can select the shapes and color them or use the Live Paint feature to make it a little faster. I'm really happy with how clean the final product is and can't wait to digitize some of my new doodles and zentangles! I'm obsessed with home/cabin design lately, since posting my mini dream home! I really love these colors -- a brighter blue, then that yellow! It has such a Mexican/Frida Kahlo feel to it. SO beautiful! Remodelista has thousands of beautiful interiors that are modern with a traditional twist. I love, love, love them! Just a quick try of a new technique thanks to some YouTube tutorials! Going to have a lot of fun experimenting with this tomorrow! Can't wait! 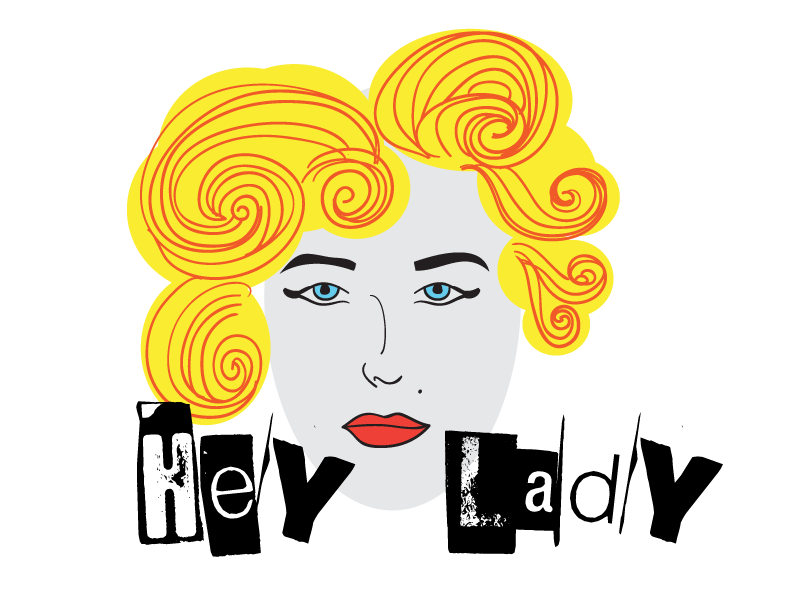 Just playing with some more digital illustrating tonight... 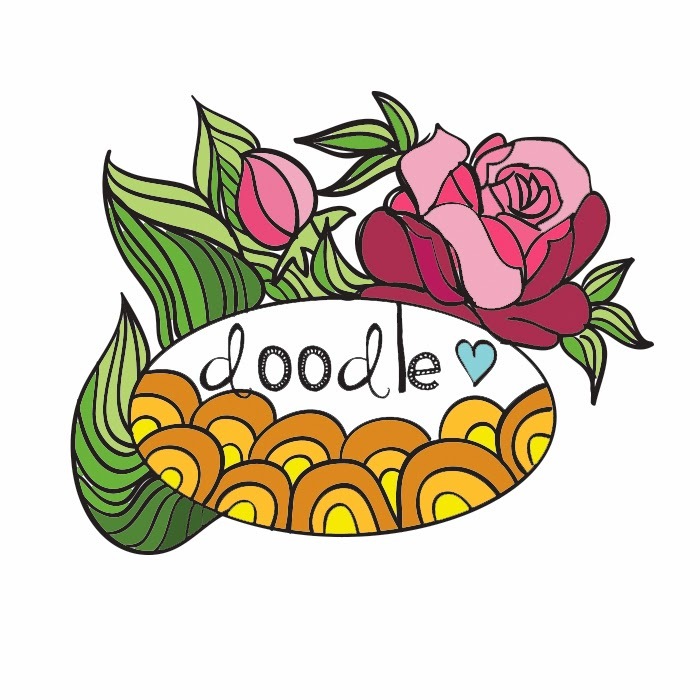 I'm still not 100% sure how I want to implement my doodles/zentangles, but I'm getting more comfortable with the Wacom and experimenting with some different techniques. 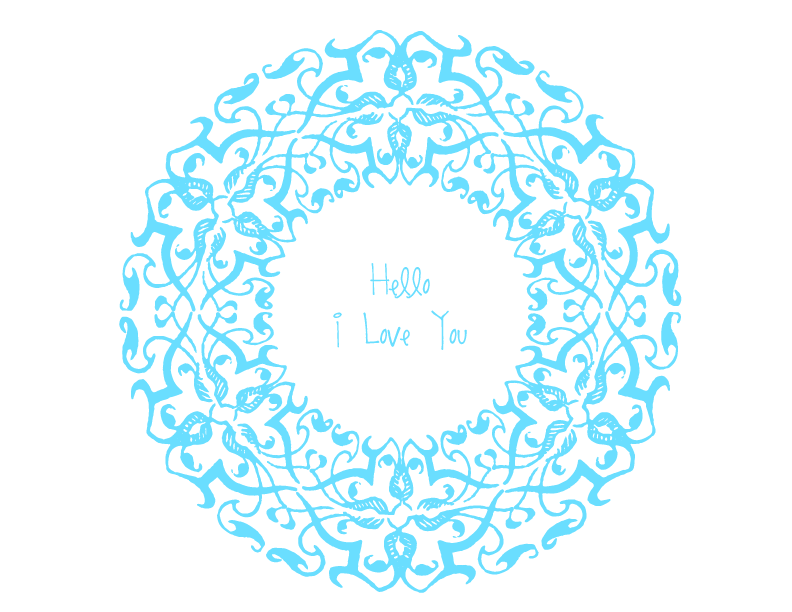 Next up, some more tutorials for how to bring my hand-drawn work into Illustrator... I have a few ideas, but I need some professional advice! 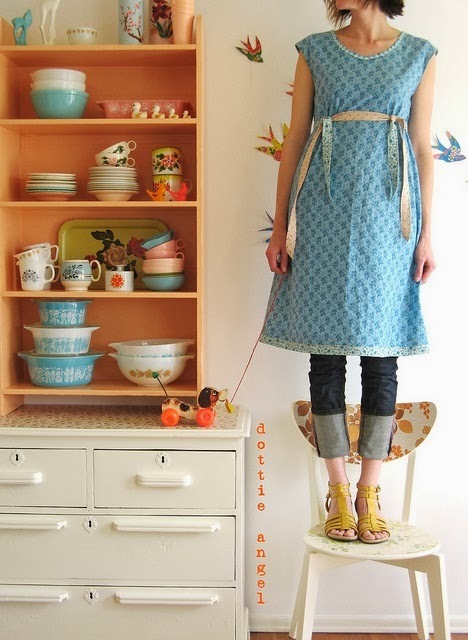 Finding myself super inspired by the works of Emily McDowell today. Check out her blog, here. It's less about her (beautiful/funny) artwork and more about her approach, I think. 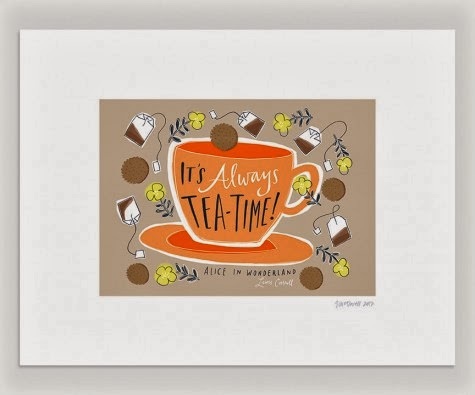 She seems to make prints/artwork out of whatever inspires her, has fun illustrating them, and then sells them on her Etsy shop. This sounds like my kind of business model! Also, she's using her Wacom Tablet to make some pretty gorgeous designs in Photoshop. Her technique is to draw her designs first then trace over them, I believe. I used to do that but found it kind of cumbersome with my old Wacom. I got a "new" one a few years ago and really haven't put it to the test! The black lines in mine and E's Battle of Land and Sea print were done with the Wacom, but I'm wondering how creative I can get with some new digital brushes. Next up! 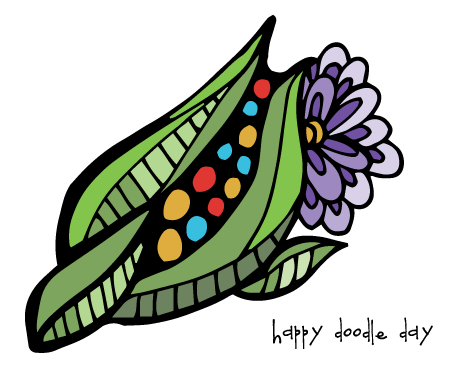 Trying some more Digital Doodling/Tangling (see previous post)! Trying out some digital doodles tonight with my Wacom! I was inspired by Emily McDowell (her site here) to try it out. She makes some pretty amazing prints with her Wacom and Adobe Photoshop. I preferred the Illustrator program, because I like how it smoothed the edges and handled the pressure of the pen. However, I wasn't thrilled with how the color filled in when I brought the image back into Photoshop. I don't know if you can tell here, but there are some white corners in the leaves. This is because I used the fill tool, and I even tried to adjust the tolerance of the tool to allow it to group more pixels, but no luck. I really had hoped to avoid drawing colored shapes behind the lined drawing to get a nice, clean color to the drawing. It's just time consuming. In the second example, I made the lines look purposely a little more "grungy" so that the white looked normal. And, ugh... I'm just not sure how I feel about that, though I do like how "jungly" this image looks. Also, it gave the rose highlights which made it look slightly more realistic. But, now it's getting late, so more practicing tomorrow night! This is one of my favorite tangle patterns. 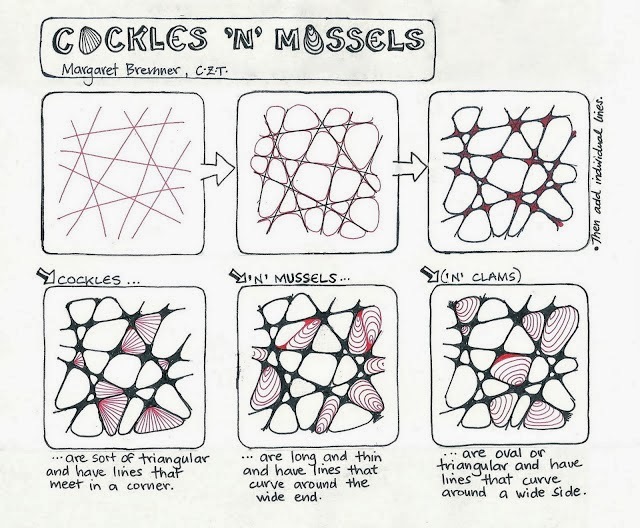 I found it through this woman's blog, where she calls it "cockles and mussels" and have used it both plain and with patterns on the circles, like the illustration below. I really love making beach scenes out of simple shapes and using this pattern as the sea bed or shore. 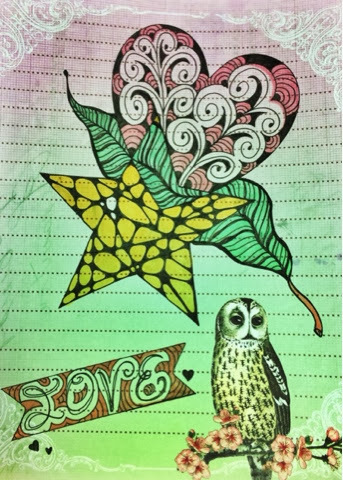 In my most recent doodle (here), I used cockles and mussels for the star shape, then the pattern I used in the heart was Opus, found here. 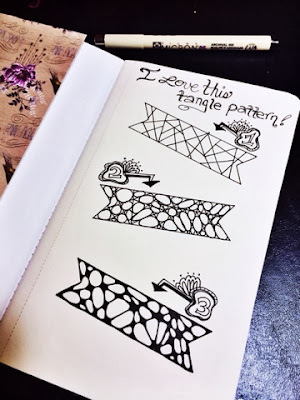 I browse for most of my tangle patterns in Doodle and Zentangle books and at TanglePatterns.com. I’m back in the office today after a “sort of” long weekend. I got to work from home on Friday due to the storm. E and I got out to play in the snow, and I couldn’t help be happy reminiscing about the big Valentine’s Day storm a few years back when Mark and I dug our car out of a snowbank, twice, because the snow was falling so fast we couldn’t keep up. We ended up going out to a nice dinner at Tanglewoods where we had the restaurant to ourselves and had our pick of choice seats. We picked one near the fireplace, had a great dinner, and a guy at the bar (who was waiting for his wife, a waitress, to finish her shift) even went out and cleared our car before we finished eating dinner. Gah! Love that small town hospitality! I’ve never really needed anything fancy on Valentine’s Day or any other day of the year for that matter. I'm pretty low-maintenance, but we used to always use that day as an excuse to get out and have a nice dinner together. This year our budget is tight, wallets empty, and our hearts are full. We can’t afford a nice dinner out, and I don’t imagine E would be happy if we subjected her to a quiet, sit-down meal at a nice restaurant. We ate left-over lasagna, watched a movie, and had a quiet dinner at home. But, Thursday night, before the storm, Mark brought us home two roses – a red one for me, and a pink one for Ellie. I’ve always told Mark that I don’t need flowers, to not spend money on them, but I have to admit that being surprised with a little bouquet has been nice when we're able to do it. 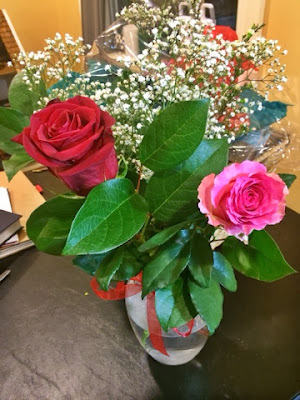 When Mark and I were first dating, he had a dozen roses delivered to my office on Valentine’s Day. I had only dated a few other men before Mark, and even though they were long-term relationships, they never sent me flowers. I was fine with that, but when I got Mark’s flowers, I got to have that good, old-fashioned, girly moment that I didn’t even know I was missing. I got to feel special. I felt like saying, “Hey, look everyone! Someone out there loves me!” -- little, awkward, quirky me in the back office of the Marketing Department. It was the equivalent of being the nerdy girl in high school and having your gorgeous boyfriend, who goes to high school in the next town over, pull up outside the school to pick you up in his new car. And, I'll always be more than happily content with the every-day romantic gestures, like when Mark makes me a cup of tea, picks up my favorite candy bar at the grocery store, and gets up with E at 2am after I had a tough time falling asleep. But, when he came home with those two roses, knowing that he had to plan this before Valentine’s Day, knowing that he was thinking of me and E as the holiday approached, my heart melted. Ellie ran up to him and grabbed her rose, cradling it in her arms like a proud Olympian. She didn’t even know what it was at first or why she wanted it. She just knew that she had something special, just for her. She pushed her nose into the tissue paper and played with the ribbon that held together her little bouquet of baby’s breath and single pink rose. I hardly noticed my red one. I was so taken with the moment, seeing her eyes light up, hearing her little giggles and cooing noises as she fussed over her bouquet. I swear in that moment, I saw her future stretch out before her, teenaged suitors lined up before a beautiful young woman whose father had set some pretty high standards for how you treat the special people in your life. “Good,” I thought. Or, maybe she’ll be the one to help hold a marriage together, even on the bleakest days, with the simplest gestures of love and appreciation. I put the roses in a vase together, mine and hers side by side. Every time I look at it, I cry. It has nothing to do with petals or stems. I see us, the love we share every day. I see us raising a baby on a tight budget, the love and bond growing and strengthening between a mother and daughter, and a dad who “splurged” by spending an extra two dollars on baby’s breath to fill out the bouquet. The next morning I woke up to find E fed and ready for the day, my work laptop all set up for me to start working, and a pretty little card with a sweet little love note on my keyboard. I couldn’t ask for anything more. Also, on Friday, my first contributing-writer blog post went live over at BVT Moms Blog! If you haven’t already, read about how Mark proposed to me all those years ago when we were two young crazy kids going to school in Burlington -- Click here! 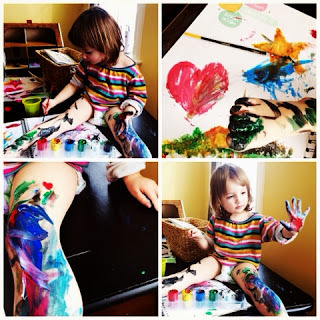 This morning, E came out of her room with some poster paints, and said, "Let's paint!" I knew what this would mean -- one big mess! But I couldn't say no to her. We hadn't painted together in so long. It was so much fun, and we managed to get another page complete in our Mess Book! I love this time with her. She's so content to just make a mess. We used stencils to make shapes. She's really into tracing right now, so they worked great to easily make some shapes that she loves, like hearts and stars! 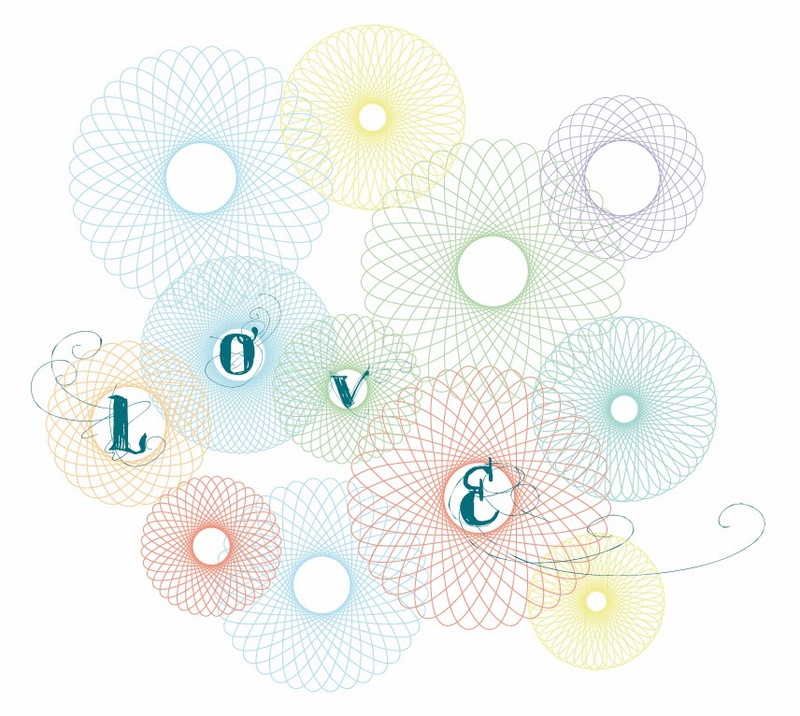 Doodling/Tangling some sweeeet love tonight in honor of Valentine's Day! And I'm trying to better schedule (see my day themes at left!) my weekly writing to give me some variety and still stick to what I love to write about. I had originally planned for Fridays to be just a funny photo I created or found, but tonight I'm doodling, and I'm tired... so this is it. Looking forward to next week and seeing if the schedule keeps me motivated and writing every day! My Throwback-Thursday posts are all about finding vintage loveliness for my future home and just for the love of all things old-fashioned and pretty! Though I think Mark still has a few (small) doubts, this is the closest we've come to agreeing on the house we want to build. I love everything about this plan -- the layout of the bedrooms, the living area, the loft. It has 3 bedrooms and 2 baths. The living area is a good size. 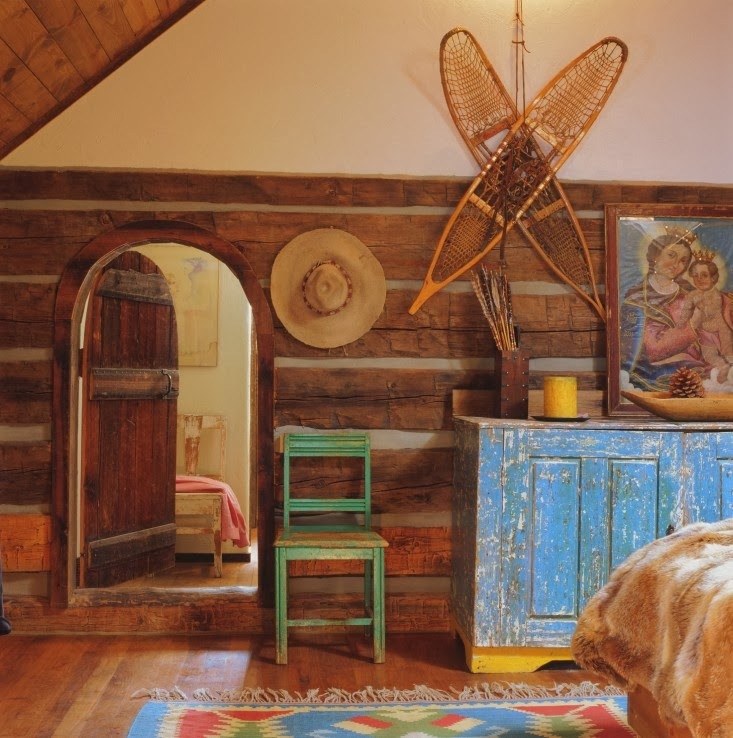 The bedrooms are small, but we have a few ideas about how to get creative with that. 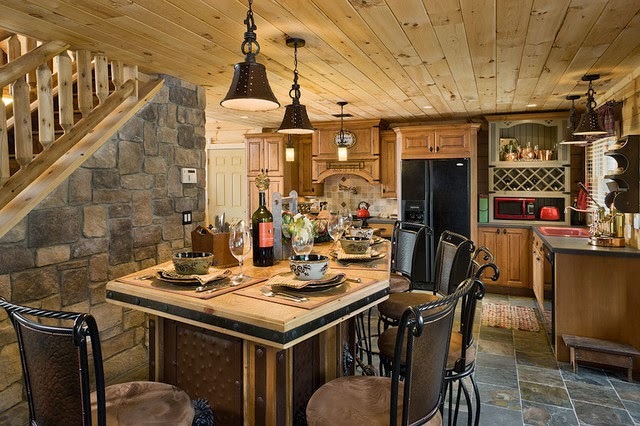 I don't love that there are so many walls with exposed boards, so we would probably sheet rock most of the interior walls (and leave the upper floors' beams exposed, like in the loft, of course). And the decor would have to change. 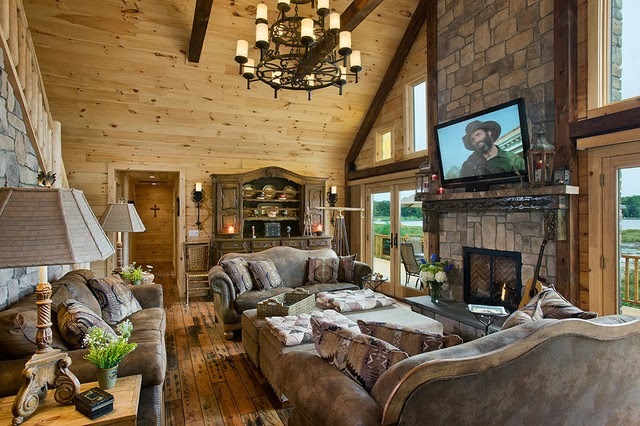 I want to do a little more modern-meets-rustic and a little less old-west-meets-drabby. The interior definitely needs more color to offset all that beige! We're looking at building in about 2+ years, just have to get our finances cleaned up a bit. I'm excited to have this goal to work toward. 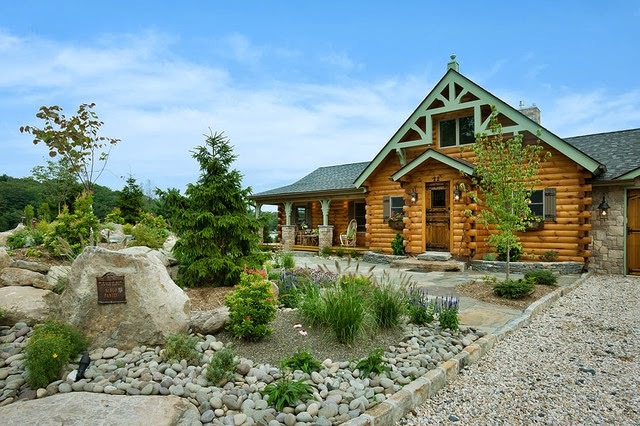 This is a mini version of our dream home, and it seems like a house that we can manage and keep up with. And if we want more kids and a dog, we'll have just enough room for both! Ok, so I thought E and I would do a trial run for some video tutorials. 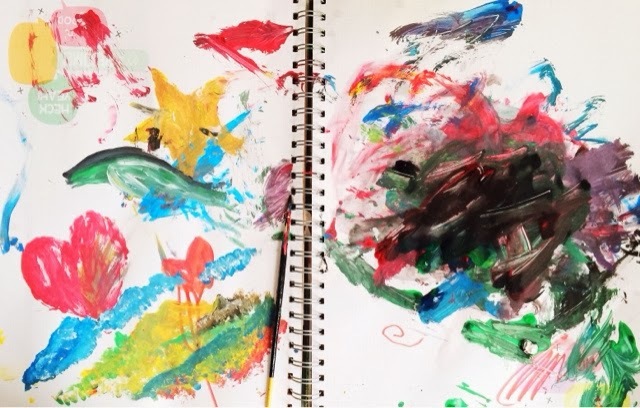 I've already posted our how-to's for the other Toddler Mess/Smash Book pages here and here. And here is my original post from back in 2012 when I was introduced to the actual Smash Book brand products from fellow blogger, Jess, over at The Girl with Curls. Even though E threw every thing that was on the table onto the floor, I think it went pretty well for a trial run... I can't wait to see how she helps with my next projects! Look forward to more (hi-res) video tutorials and silliness from us in the future! "Mark, stand under this sign and smile." "Why? What does the sign say?" First off, thank you for your patience in waiting for my next blog post this week. My little girl spiked a fever of 103.8 mid week. Yikes! Midnight bath to cool her down, and lots of fever-reducing medicine to get her back to a manageable temp! Mark and I did our usual trade-off system, where I go to work for a few hours in the morning, we trade off before noon, and he works from home, then I jump back on my laptop when E goes down for her nap to wrap up any last minute tasks before the end of the day. In between is all chaos, pushing E to drink liquids, and watching Care Bears. 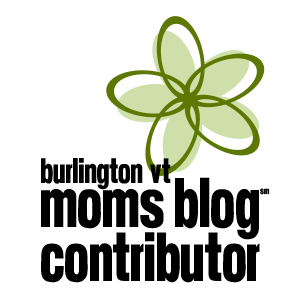 I also worked on a new logo design this week and updated the YMIS Design site. And in other big news, I'm pleased to announce that I've joined the team of writers at the BVT Moms Blog. Check out my profile on the Contributors' Page! What does this mean for YMIS? Everything stays exactly the same! 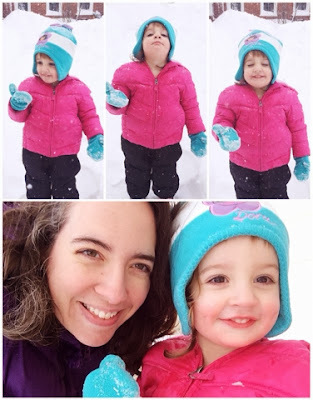 Once a month, I'll just write a piece for BVT Moms, and I'll make sure to let you all know via Facebook/Twitter/this blog, so you can mosey on over there and check it out! For the month of February, I'm doing an intro piece about me. I'm thinking that the best way to introduce myself and my family is to start from the very beginning and tell about Mark's proposal. It really sums up our life mission and expectations and sets the stage for future stories about times when I should have been disappointed but was instead head-over-heels in love with my simple life. Haha! Also stay tuned for the following this spring! 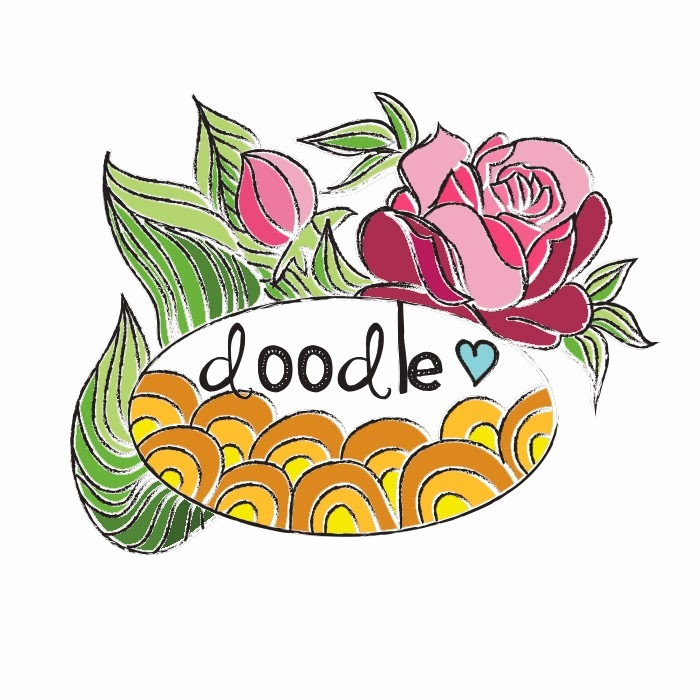 I'm redesigning my Etsy shop to provide more digital scrapbooking supplies and drawing/doodling templates. It's going to transform into the YMIS Digital Dollar Store. I can't wait! I'll be starting a new housecleaning/household management schedule for myself that I'm sure I'll abandon in a week, but whatever! Per the poll I posted this week, I see that the majority of my readers (all 7 of you, 5 of whom I believe to be me accidentally voting too many times, and 1 of whom was Mark) would prefer more drawing/artsy posts and tutorials with the usual family story thrown in. Vote, and you shall receive! More drawing and doodling this week, and stay tuned for some video tutorials on lettering and doodling! We're starting the (very) beginning stages of building our (mini) dream home. So, I'm putting together a virtual dream board of everything I want in my future home. Will share soon! Lava lamp. Check. Rotating bed with tiger-print throw blanket. Check. Well, dinner is in the oven, and I expect E will wake up any minute from her late nap, so I'm off! Take care lovely readers, and I'll check in again soon this week! A digital sketch for the sketchbook tonight! I'm back from New York, where I spent a fantastic weekend visiting with my new baby niece, Sarah! I can't believe that she is girl number four, including my E! Still waiting for a boy on my side of the family. She's an absolute doll. This was another weekend that I went away on my own. Mark and E went to Mark's sister's and mother's house for some extra support over the weekend. It was a nice, relaxing trip for me -- almost too relaxing. Getting packed for the trip with a toddler "helping," was a lot on my nerves, and when I finally settled into the (too) quiet car for a four-hour journey, I didn't know what to do with myself. I drove I89 for about a half hour, battling the Friday-evening traffic, listening to nothing but the whir of the road and cars buzzing by. I finally reached for my phone to put on some music. Shuffle picked Young MC -- Bust a Move. Wow, have I dated myself? I mean, have I revealed my true age (cough) 30 (cough)? Not... have I ever taken myself out for a nice meal and a night of dancing to Bust a Move. No matter how old I get, these types of songs still make me feel hip. Is it just me, or do these songs never get old, never really lose their "groove." Okay, the lyrics are... hilarious, but the beat is great, the energy makes me dance behind the wheel of my white Nissan Versa... with pink carseat in the back. After listening to that song on repeat a few times, I was still on my I'm-So-Hip high when I stopped at the mall and headed for Claire's. Ahh, Claire's -- where afternoons as a teenager were spent picking out plastic heart earrings and barrettes. Where we sought refuge, as our high school crushes walked by with their baggy, ripped jeans and No-Fear t-shirts. I was the awkward girl hiding behind a hot-pink, feathery boa, afraid to be caught following cute guys around the mall. My more-confident best friend casually browsed the snap-bracelet bin. Now, I wandered into Claire's as a mom. Yikes. I heard that they were the only store around that sold mood nail polish (I wanted some for myself and my nieces). I asked the girl at the counter if they had it. Her bubbly attitude, bubbly hair, bubbly gum, bangle-covered wrists, and way-too-much eyeliner made me suddenly aware of every single wrinkle, crease, and mole on my face and the fact that I felt very tired. She chewed her gum emphatically, "Nah, we don't have that. We had it, like, years ago, but it totally clearanced out." Clearanced? Is "clearance" being used as a verb now? What year is this? "Oh, okay," I said, "... and how does this work?" I held up a bottle of multi-colored, layered nail polish. "Well, you don't shake it. Every time you paint, you get a different color on your nail. So, this one might be pink." She held up her pointer finger to me, "and this one, would be, like blue." She held up her thumb. Apparently, I looked like the type of person who needed this explained with visuals. "Ok, thanks!" I said, as I continued to browse, "You know, I forgot all of the neat stuff that was always in this store. 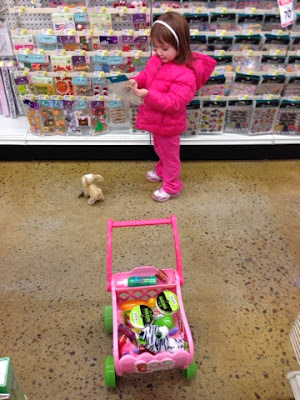 I used to come in as a teenager, and now I have a daughter of my own to shop for." When I looked up to see her reaction, she was picking something out of her pink fingernail. "Oh yeah," she said, bored, distracted. When did this happen? When did I become "not hip" and not the "awkward, almost-hip" kid. When did I not become a "kid" any more. I started to hyperventilate. Standing there in Claire's surrounded by neon pink... everything. I looked down at my outfit. I was wearing navy blue and teal. "Okay, keep it together, Gretch," I told myself. I grabbed my multi-colored nail polish, a pair of sunglasses, and tried to checkout as fast as I could. While my items were being rung up, I reached for my phone simply out of nervous habit, opened it, and my Music app was open. It had been paused while I had taken a phone call, but now it started blaring. You want it? Baby... You got it (Just bust a move)! In reality, the most likely thing for me to do would be to awkwardly shut off my phone (smashing my fingers into it, looking just like my grandma trying to make steamed peas in a microwave). "Gah! What the!?" Then, I would quickly grab my bag, my change, and run out of the store as fast as a 30-year-old in skinny jeans could move. But, in my mind, and in some other dimension, I know that, when that song came on, that 19-year-old cashier would have spit out her gum, reached for my hand, and we would have danced our hearts out on the Claire's checkout desk, to a song powerful enough to bridge two generations. Pink feathers would rain down on us as boas flew through the air, and as I reached for them, bangles would fall onto my wrists, hoop earrings would grow from my ear lobes. My wrinkles would fade away, and the wind of another age would tease and crimp my hair. And, in my mind, in that dimension, all is right with the world. I just wanted take a serious moment to inform you about an important cause I learned about this week and to spread the word about "LungLeavin' Day." Cameron wrote to me about his amazingly strong, beautiful, and inspirational wife, Heather, who was diagnosed with mesothelioma, a rare cancer that kills most people within 2 years of diagnosis. She had just given birth to their daughter, and was only given 15 months to live. After a year of life-saving surgery that included the removal of her left lung, LungLeavin' Day was born. This will be the 8th year of celebration -- on February 2nd. Cameron explains, "The purpose of LungLeavin' Day is to encourage others to face their fears! Each year we gather around a fire in our backyard with friends and family, write our biggest fears on a plate and smash them into the fire. We celebrate for those who are no longer with us, those who continue to fight, for those who are currently going through a tough time in their life, and most importantly, we celebrate life!" What a beautiful way to celebrate the release of fears. As a mom, I couldn't possibly imagine what it would be like to celebrate the beginning of a new life with the constant worry that you may have to leave your child behind. 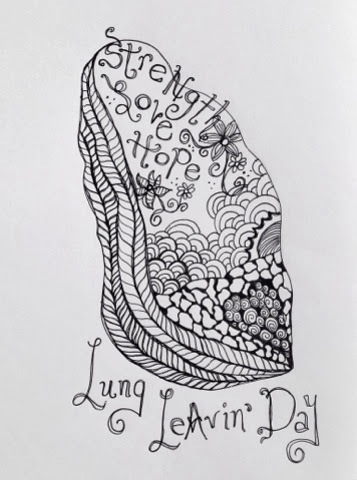 Please visit the LungLeavin' Day page for more information about this special day, and join me in sending positive thoughts, prayers, and healing energy to this beautiful family. Much love to the Von St. James family!